Hi, I’m Dave Edwards. I designed and flew the Affordaplane ultralight airplane starting back in 1999, and my life’s dream and mission has been to help people to fly. 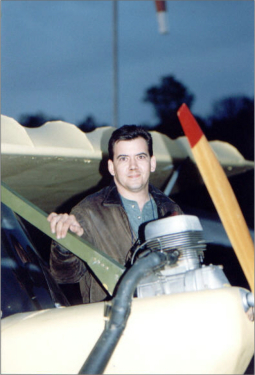 For over 18 years I have helped a whole lot of people build and fly their own airplanes. You are here probably because you want to fly, or are already flying and are looking for a safe, inexpensive airplane to explore the sky in. That’s why I designed this aircraft. I was a teenage airport kid back in the eighties when ultralights exploded on the aviation scene, and I was right in the middle of all that. 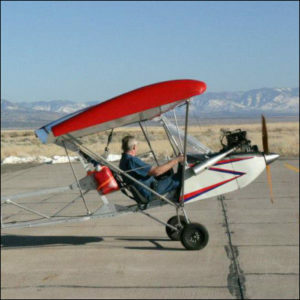 To me, ultralights were and are the ultimate expression of freedom. You don’t need a license to fly them, but you do need training. Give me a grass strip and a couple of bucks worth of gas, and I can go flying, any time I want. I don’t need a radio, don’t need an expensive transponder, and I do not need an annual inspection. I do all the inspecting myself. When you build it yourself it gives you invaluable experience and confidence in the air that you just do not get by buying a completed airplane from someone else. That’s one big reason building an airplane is so appealing to people today. You know your aircraft. The other is money. You save a LOT of money when you do it yourself. And you can build as your budget allows. My airplane is all aluminum, and you can build a part then store it until you are ready for something else. It won’t rust or rot. Most of the materials to build my airplane you buy locally. Nowadays you can get all your metal locally, even my windscreen came from Home Depot. Your bolts you buy from an aircraft supply house. Your motor can come from a motor company, or many people get them off Ebay or other places like Barnstormers.com. The fabric to cover the wings and tail come from Aircraft Spruce. And the biggest ‘secret’ is that building an airplane like mine is easy. Really easy, like building a large model airplane. You just have to pay attention to details, and if you can follow a good set of plans, step by step, you got it. Thousands of people since the Wright Brothers have done it, and you can too. The A-Plane’s fuselage is made of square aluminum tubing, with flat plate gussets bolted to them to hold it all together. I designed it this way for a number of reasons: One is that it’s extremely strong but light. Gyrocopters have used this method for decades. Two is you can cut it with a chop saw or jigsaw, drill it and it is basically done. There is no welding involved at all with this airplane. You do not have to have welding equipment, and you never have to worry if your welds will hold. Plus everything is out in the open, there is nothing hidden that can cause problems. You don’t even need to paint it. I have helped many people build their fuselage in one single weekend, and that is unheard of in homebuilt aircraft construction. But that just shows how simple this airplane really is to build. 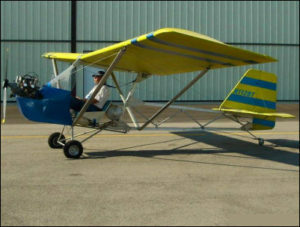 The wings and tail are made of round aluminum tubing, and is of the same type of construction as many other ultralight airplanes. They are covered with dacron, shrunk with a clothes iron, and painted with house paint. It looks great and holds up for years. The airfoil used gives you the most performance out of 40 hp. The stall is gentle and straightforward. I designed full span ailerons for the wings. Crosswinds are no problem at all. She goes where you point her. And if there is one thing I am most proud of, it’s how she flies. In a word: Great! All the pilots that have flown her say she is a very sweet flying airplane. The Affordaplane is a solid, proven design that has been flying for over 18 years and has logged thousands of hours. If you build it as an FAR 103 legal ultralight, it comes out at exactly 254 pounds. My airplane has been swarmed over by EAA designees, FAA aircraft inspectors and shown at many airshows. And it was weighed and inspected down to every nut and bolt. 254 pounds is what it weighs if built as a legal ultralight. But many people now build it as a Light Sport Aircraft, because they can log hours in their logbook. So it’s your choice. The Affordaplane is a simple, fun airplane to build and fly. 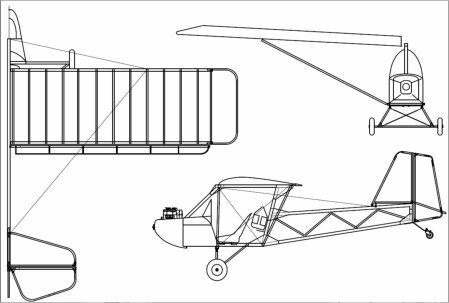 The construction plans are designed for beginner and expert alike, and contain everything you need to build this airplane. It’s the input and feedback from my customers and friends who have made them as complete as they are. And they are very inexpensive for what you get. Keep your flying dreams alive, they will never let you down. I hope you have a great day. Blue skies!